Rural lifestyles and agricultural roots run deep in Salmon, Idaho and throughout Lemhi County. Encompassing about 3 million acres, Lemhi County is home to miles of backcountry roads and trails, the Salmon River, and part of the Frank Church-River of No Return Wilderness (Sidebar). About 90% of the county is federally owned with 71% managed by United States Forest Service (USFS) and 20% by the Bureau of Land Management (BLM). Rangeland and wildland resources on these public lands are important for livestock production, wildlife habitat and recreation. “Less than 8% of our county is under private ownership, so it was important to develop strong partnerships with our federal agencies to protect these lands from invasive plants and effectively manage infestations in Lemhi County,” says Shannon Williams, Extension Educator for Lemhi County. The Lemhi County Cooperative Weed Management Area (CWMA) was formed in 1998 by the Salmon District BLM and the Salmon-Challis National Forest in cooperation with Lemhi County Cooperative Extension Service. The Lemhi CWMA encompasses the bulk of the county with the exception of the Frank Church-River of No Return Wilderness, which lies within a different CWMA. A strategic plan was ratified by participating agencies in 2001. 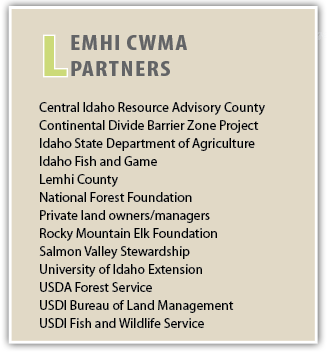 “The mission of the Lemhi CWMA is to bring together all land owners (private, federal and state) who have responsibilities to control weeds within the boundaries of the Lemhi CWMA to develop common weed management goals,” explains Daniel Bertram. Bertram is the weed superintendent for Lemhi County and a core member of the CWMA steering committee. The financial resources provided by the CWMA partnership and strong support from Lemhi County funds the weed superintendent position and a permanent technician to supervise seasonal work crews and serve as the database manager for the CWMA. “The participating agreements we have with agencies through the Lemhi CWMA are important for consolidating funding,” says Bertram. Participating agreements are approved for five years, which allows for program consistency. Agency funding for invasive plant management following fires, and other county, state, and federal funding for weed control goes directly to the Lemhi CWMA and can be allocated over time to more efficiently utilize dollars where and when they are needed. The Resource Advisory Committee (RAC) has been a key partner in providing funding to the CWMA for invasive plant management on private and federal lands on the Salmon River corridor. A steering committee composed of federal, state, and county natural resource managers, private landowners and agricultural and industry representatives work together to prioritize weed species and areas for treatment regardless of land ownership. “One thing that makes Lemhi CWMA so unique is that all our invasive plant activities are done with inter-agency cooperation,” explains Diane Schuldt, wildlife biologist and noxious weed program coordinator for the Salmon-Challis National Forest. “The CWMA blurs ownership boundaries in Lemhi County and there are no territorial issues between agencies,” says Schuldt. “Another key to our success is that many of us on the steering committee have been involved with the program since its inception. We share the workload, share resources, and have same goals and objectives for our program.” To provide additional support to the program, the USFS houses and manages the weed inventory and monitoring data for the CWMA. Controlling rush skeletonweed as part of the Continental Divide Barrier Zone Project in Lemhi County. Student and 4-H volunteers work together to established spotted knapweed biocontrol insectary. Spotted knapweed is the most problematic and widespread weed in Lemhi County infesting about 65,500 acres within the CWMA. “The county treats about 1,000 acres of spotted knapweed each year and is getting excellent control with Milestone at 5 to 7 fluid ounces per acre (oz/A) or ForeFront® R&P at 2.6 pints per acre [GrazonNext® HL at 2.1 pints per acre],” says Bertram. Milestone is applied rosette to bolt growth stage or in fall and ForeFront R&P is applied when spotted knapweed is flowering to help stop viable seed production. Herbicide treatments are combined with biological control agents on larger infestations to help reduce knapweed spread. 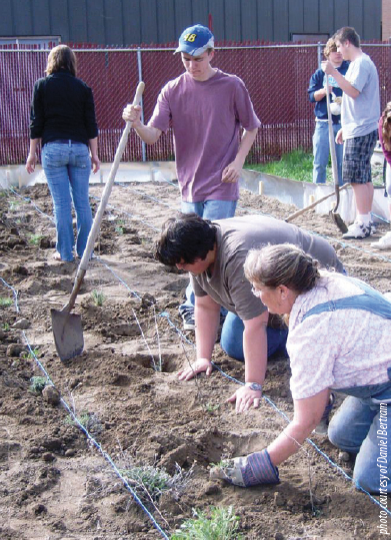 In 2010, local high school students and 4-H groups with the help of the environmental science teacher and USFS weed crews built a spotted knapweed biological control insectary. The insectary will be used as a source for biological control agents on spotted knapweed within the Lemhi CWMA and for educating students and others in the community about biological control of invasive plants. Pictured left to right, three of several Lemhi CWMA partners Shannon Williams, Daniel Bertram, and Diane Schuldt. A risk assessment for Milestone and four other herbicides by the BLM should be completed this summer. The supplemental NEPA document will be needed following completion of the risk assessments. The NEPA documents should be completed the winter of 2012. Pending completion of the necessary documents and funding, the use of aminopyralid (Milestone) and its tank and premixes will be available for use in fall of 2012on BLM lands. Tordon 22K is a federal Restricted Use Product. Label precautions apply to forage treated with Milestone and ForeFront R&P [GrazonNext® HL]and to manure from animals that have consumed treated forage within the last three days. Consult the label for full details. Milestone and Forefront R&P are not registered for sale or use in all states. Contact your state pesticide regulatory agency to determine if a product is registered for sale or use in your state. Some states require an individual be licensed if involved in the recommendation, handling or application of any pesticide. Consult your local extension office for information regarding licensing requirements.